At the beginning of 2013 Derek Lichti, University of Calgary, has taken over as editor-in-chief of the ISPRS Journal of Photogrammetry and Remote Sensing, from George Vosselman, University of Twente. George has stepped down after some 10 years of yery successful word which earned the journal a top position in the worldwide ranking of journals in our discipline. For his accomplishments George was awarded the Schwideswsky Medal to the 2012 ISPRS Congress. We thank them all for their willingness and enthusiasm to further develop the journal and wish them lots of success and satisfaction in the job. ISPRS is proud to be part of the Fourth International Conference on Earth Observation for Global Changes as part of the 2013 Annual Conference of Canadian Institute of Geomatics. (CIG) to be held at Ryerson University, Toronto on June 5-7, 2013. ISPRS is one of the official supporters of the Milsatcom Middle East Summit which is co-located with Global Space and Satellite Forum taking place from 7-8 May 2013 in Abu Dhabi, UAE. ISPRS will receive a 10% discount to attend. » Visit www.milsatcom.me or www.gssforum.com for more information. email info@gssforum.com to register and quote "SO-ISPRS" to avail the offer. The National Institute of Statistics and Geography (INEGI) of Mexico, has developed the Digital Map of Mexico 5.0 Visualizer, which allow all sectors of the society the use, analysis, interpretation and integration of the national statistical and geographical information, leveraging open code robust modules and new technologies, developing components for better functionality by applying best practices, allowing its evolution in accordance with institutional goals in order to establish a platform for consultation of the geographic and statistical information, see http://gaia.inegi.org.mx/mdm5/ for more information. It was Sunday morning, seven weeks after the end of the XXII ISPRS Congress in Melbourne and I opened my computer to write this invitation for the future one. The past congress brought the 21st century tools to a 102 year-old lady - ISPRS. APPS replaced paper posters, a film replaced a textile ISPRS flag and everything in town having a museum dedicated to immigrants to this continent was in an early spring coat, unlike most of the other congresses. The first trees came out to blossom during those eight days. The General Assembly decided that the next congress will take place in my town - in Prague. I was born there and I know very well where I am inviting you all. It was a capital of the Czech lands (Bohemia, Moravia and Silesia) since their existence under various names - Czech Kingdom, Habsburg Monarchy, Czechoslovakia, and Czech Republic. 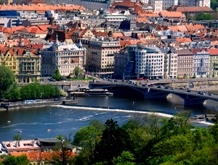 The city is cut into two parts by the Vltava River, an effluent of the Elbe River and an inspiration of one symphonic poem of Bedrich Smetana’s cycle, My Fatherland. Our predecessors found the valley good for life on both sides of the river and occupied the valley and continued to its surrounding hills. 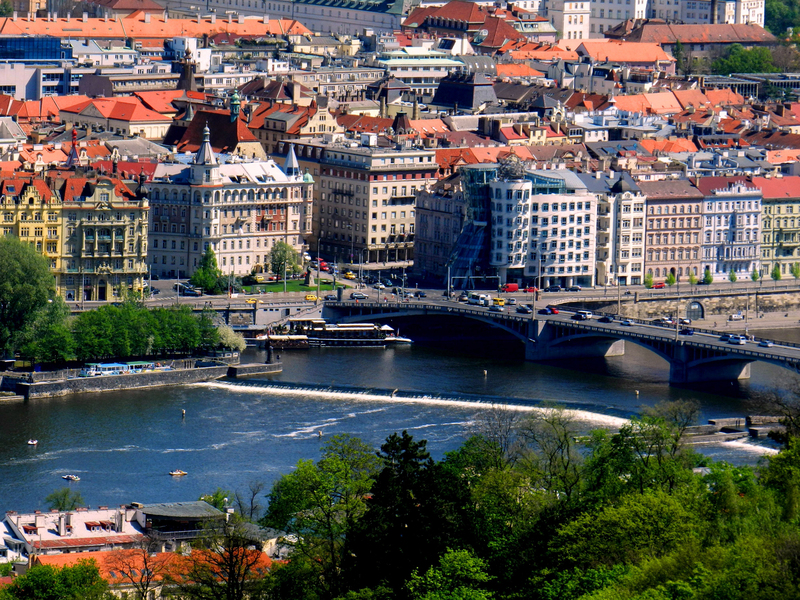 Prague is a picturesque town with 1,2 million inhabitants living in the area of nearly 500 sq. km. 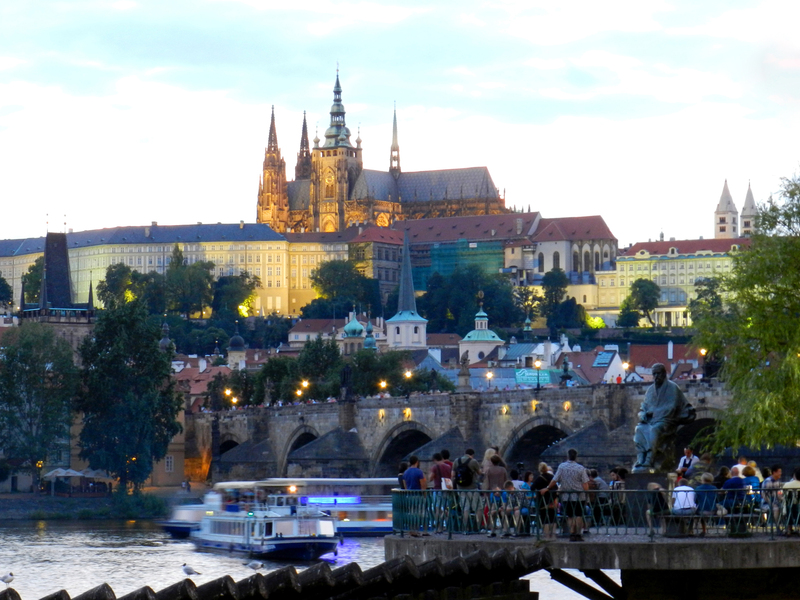 Prague’s history has been developing for eleven centuries. Its foundation is not officially documented. There is only one legend describing its foundation as a prophecy of the best known Czech legendary princess. Her words in the legend “I can see a great town whose glory will touch the stars” belong to a well known historical sentence of people in my country. The historical centre, including Prague Castle are on the UNESCO list. The town is connected with music by Mozart, who loved Prague and its inhabitants loved him, by Antonín Dvorák, by the Czech Philharmonic Orchestra.... Prague is a collection of art and architecture. It is difficult to say and write which architectural style can be found the most often here; probably baroque with many churches, however, also with statutes on Karluv most (Charles Bridge). As A list of famous people living in Prague starts for us by Charles IV, son of Jan Lucemburský. Many times is his name used as a thank you from our nation to this king who brought wine from France, founded the first university in Central Europe, built the above mentioned bridge, etc. Being married four times in his life he made our kingdom the largest in its history spreading from the Baltic Sea to the Adriatic Sea - each wife enlarged the kingdom by her territory. As far as talking about famous people in Prague, we cannot omit Franz Kafka, a writer in the first half of the 20th century, Miloš Forman, a film director, and Václav Havel, a writer and the first president of the Czech Republic. However, it is not necessary to be famous, it is necessary to want to come and confirm my words and feelings about my city and my country; the latter was described by a Czech contemporary writer in a film very popular here: ‘It is not a country, it is a small garden’. The ISPRS WGIII/4 committee cordially invite you to submit and present your latest research work at the ISPRS International Workshop on Virtual City Modeling (VCM) 2013 at the University of Regina, Regina, Canada. This is the first Call for Papers for the VCM 2013. The VCM 2013 will be held in conjunction with the 10th Conference on Computer and Robotics (CRV) 2013 on May 28-31, 2013. Global change is one of most important and active research topics worldwide. Earth observations science and technology has proved to be a very powerful means to study global changes. The Fourth International Conference on Earth Observation for Global Changes (EOGC 2013) is designed to advance research and development as well as encourage innovative applications of geomatics technologies in global change studies and to specifically address the international aspects of the coupled social, land and climate systems in global change studies using advanced geospatial tools, spatiotemporal models, and earth observation systems. The conference offers an interdisciplinary forum in the fields of remote sensing and photogrammetry, surveying and mapping, geodesy and geosciences, geography, marine science, forestry, renewable energy, environment, transportation, disaster management, and climate change science. I am delighted to announce the 1st call for papers for the 9th International Workshop of the EARSeL Special Interest Group (SIG) on Forest Fires that will take place in Coombe Abbey, Warwickshire on 15-17 October 2013. The workshop is organised by the University of Leicester with support from the Laboratory of Forest Management and Remote Sensing, Faculty of Forestry and Natural Environment, Aristotle University of Thessaloniki. The Leicester hosted workshop is the latest in a series of technical meetings organised by the EARSeL SIG on Forest Fires after its foundation in 1995. Previous meetings were held in Alcalá de Henares (1995), Luso (1998), Paris (2001), Ghent (2003), Zaragoza (2005), Thessaloniki (2007), Matera (2009), and Stresa (2011) and resulted in outstanding progress made in forest fire research. The deadline for abstract submission is 1 March 2013. Antarctica region is a crucial area for the climate change study on the whole Earth. Remote Sensing technology is one of the most important methodologies for data collection and change monitoring in this area. Modeling and application oriented contributions, investigations on the use of existing and new sensors, and experiences about data integration and cross-validation with both spaceborne and ground-based sensors (e.g. GNSS, ice penetrating radar) will be discussed in the workshop. The eventful days during the ISPRS Congress in Melbourne are over, and the workshop season In Europe and elsewhere is almost concluded, so that it is time to get back to serious business. ISPRS Council has offered in November 2011 to the new initiative of the United Nations Global Geospatial Information Management (UNGGIM) of the Statistics Division of the U.N. Secretariat in New York to cooperate in a joint project to determine the current status of topographic mapping and data base updating in the world. This was welcomed by Dr. Paul Cheung, Director of the U.N. Statistics Office. The effort was long overdue. It is a continuation of the efforts of the U.N. Secretariat of the 1960´s to the 1980´s. Despite of several U.N. resolutions the project was never continued due to lack of funding. In a discussion between ISPRS President Chen Jun and Prof. Gottfried Konecny in Guilin in October 2011 this idea was arisen again. This is the third part describing the prestigious awards presented at the 2012 ISPRS Congress in Melbourne. Some of awards presented to members of the scientific community were already mentioned in the previous two issues of the eBulletins. a Professor of the Department of Network and Computer Engineering of Tokai University, Japan, was awarded the Samuel Gamble Award for his significant contributions to the development, organization or professional activities of remote sensing, especially in Asia. Prof. and Canada Research Chair in Advanced Geomatics Image Processing at the University of New Brunswik in Canada, won the Giuseppe Inghilleri Award, for having significantly enhanced the applications of photogrammetry, remote sensing or spatial information sciences in the 4 years preceding the Congress. The recipient of the Eduard Doležal Award to assist individuals or representatives of institutions from developing or reform countries to participate in the ISPRS Congress, was George Sithole. Dr. Sithole is a senior lecturer of photogrammetry at the Geomatics Department of the University of Cape Town, South Africa. Commission VIII: Amelia Budge, University of New Mexico. Late last year the sad news reached ISPRS, that Prof. Dr.-Ing., Dr. sc. techn. Ákos Detreköi, a prominent Hungarian photogrammetrist, had passed away on December 18, 2012. Dr.-Ing. Enrico Clerici (73) passed away on October 26, 2012 in his new home in Rivergaro / Italy after a long and serious illness. Karl Rinner, born on October 4, 1912 in Gratkorn, near Graz would have been 100 years old this year. He dies at the age of 78. But the traces he left during his lifetime can still be felt in the present generations. This is the reason why the Austrian Geodetic Commission, the Austrian Society for Surveying and Geoinformation and the Technical University of Graz organized a Memorial Colloquium on October 27, 2012 on the occasion of Karl Rinner´s 100th anniversary of birth. About 80 participants had come from Graz, Vienna and the neighbouring countries of Austria for the event. The moderation was done by Vice Rector Bernhard Hofmann-Wellenhof of TU Graz. 4 daughters of Karl Rinner were also present. Karl Rinner was an important photogrammetrist, but he was also considered a leading scientist in other disciplines such as satellite geodesy and engineering surveys. In Austria he is still sometimes called “a Universal Geodesist”. ISPRS Workshop "Global Geospatial Information"